This is a rough test to estimate the reduction in heat transfer for RV windows with thermal shades compared to single glazed glass windows. These are commercial shades that are cut to fit the ProMaster windshield. They are made from a 7 ply insulating material in which the side that faces out is highly reflective. They are secured with suction cups that are built into the shade. These shades are cut from Reflectix insulation and secured with Velcro tabs. Reflectix is about 1/4 inch thick bubble wrap like material with highly reflective coatings on both sides. The test measured the surface temperature of the shades on the inside. The idea being that the warmer the shade surface is, the less heat transfer from the room air out the window. 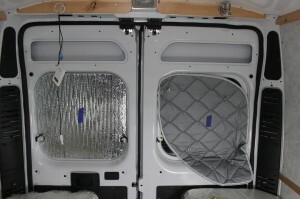 2- The Reflectix appears to be about 20% more effective in this test on reducing heat loss than the Eurocamper material. The way the Reflectix hangs on the window, it maintains a nice consistent about 3/4 inch air gap between the window and the Reflectix that tapers to near zero at the edges. The EuroCamper material has a gap that is near zero at the suction cups and generally pretty small everywhere. The consistent 3/4 inch air gap on the Reflectix may provide a bit more insulating value than the closer and variable air gap on the EuroCamper shades. The test is not perfect and I’d hesitate to read too much into the difference between two shades — I think the main message is that they both do well. 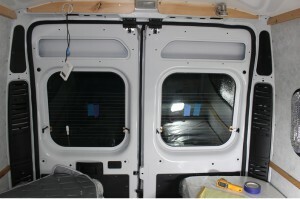 The comparisons were done using the two back windows of my ProMaster camper conversion van. The two windows are identical and have air temps and air currents on each — so, side by side comparisons can be done using one shade material on the east window and the other on the west window. The test was done after sunset to avoid solar heat gains. The outside temperature was about 29F, and the in a sheltered area with very little wind. The heat transfer from the room air to the window or shade surface depends primarily on the surface temperature of the shade or window — the warmer the shade temperature, the less the heat loss. Measuring window temperature with no curtains. Measuring window temps with Reflectex on left and Eurocamper on right. The Reflectix on the left are the actual shades I’m using on the van back windows, and the Eurocamper shade on he right is actually intended for the driver door window. The Eurocamper shade does not (of course) fit the back window perfectly, but I think its close enough, and, to me, it was better to do this than to use one back window and one driver door window for the test. The inside air temperature probe is the hanging down about 11 inches in front of the left window. The squares of painters tape on the shades were used as points to take the temperature readings with the IR temperature gun — they provide a constant emissivity that the IR gun needs for accurate readings. Temperature MeasurementsTaking a reading of the glass temperature and shade temperature. The 2nd piece of tape is on the outside of the glazing (was intended to bet outside glass temps, but was not used). Temperatures of the glass and shades were measured with a Fluke IR thermometer with the emissivity set to 0.95. 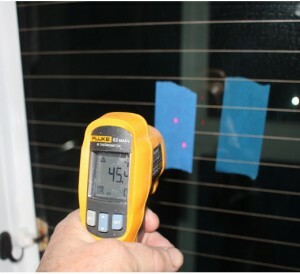 Small squares of painters tape (emissivity 0.95) were applied to the inside surface of the glass and shades to take the readings on. This is especially important for the Reflectix, which probably has an emmissivity less than 0.1 without the tap. The inside and outside air temps were measured with Hanna Instruments temperature probes. These are good quality instruments that are certified to be within 0.5C. The inside air temperature was measured 11 inches from the glass and about 1/3rd of the way up the window. The outside temperature was measured about 8 inches from the glass near the bottom of the window. The first two points at 6:25 and 6:30 were just the bare glass with no shades just to make sure the readings were consistent between the two windows. The readings at 6:43 and 6:50 were done with the Eurocamper shade in east window and Rflectix in west window. The readings for both materials show a good reduction in heat loss compared to the bare windows, with somewhat more reduction with the Reflectix. The readings starting at 6:57 and ending at 7:10 PM are done with the east window bare and the west window with EuroC in one case and Rflextix in the other. They are consistent with the the other readings and help to confirm the results. The “Relative Heat Losses” are estimates of the heat loss in BTU per hour per sqft of glazing per degree of temperature difference between inside and outside. The calculation is done based on the difference in temperature between the shade surface and the inside air, and assumes that the R value of the air film just inside the shade is 0.65 (this is the standard value normally used for still air film resistance on window heat loss calculations). So, the calc is just Heat Flow = (Tin – Tshade)(1 sqft) / (R0.65) . Bottom line result is that the shades drop the relative heat loss from about 30 BTU/sqft-F down to about 7 to 10 BTU/sqft-F. The single glazed windows are about R1, and with the shades the total R value is about R3 to R4 — about the same as a very good double glazed, low e, argon filled house window. Thank you for such wonderful research on window insulation in a van. How does uncut reflectixs compare to the uncut material of 7 layer insulation offered by Eurocamper? I know that reflectix is lower in price. Thank you. I think they are pretty close thermally. The 7 layer stuff from EuroCamper looks a bit nicer and the duller inside finish is easier on your eyes than the highly reflective Reflectex, but, insulation wise they are pretty close. Hi Paul — let us know how it works out.